CAPT Overstreet, a native of Lemoore, California, graduated from Virginia Tech in May 1991, where she earned a Bachelor of Science degree in Mathematics. Upon graduation, she was commissioned as an Ensign through the Naval Reserve Officer Training Corps (NROTC). She earned her Wings of Gold in June 1994 and headed to VAW-120 Fleet Replacement Squadron to train in the E-2C Hawkeye. CAPT Overstreet's initial fleet assignment was with the “Seahawks” of Carrier Airborne Early Warning Squadron 126 (VAW-126) at NS Norfolk. She deployed onboard USS Theodore Roosevelt (CVN 71) and USS Enterprise (CVN 65) in support of Operations Desert Fox and Southern Watch over Iraq, and Operation Deliberate Forge over Bosnia. Her Department Head tour was with VAW-123, deploying onboard USS Enterprise (CVN 65) in support of Operation Enduring Freedom and Operation Iraqi Freedom. CAPT Overstreet commanded the Wallbangers of VAW-117. Her tour was culminated by an eight-month combat deployment in support of Operation Enduring Freedom onboard USS Nimitz (CVN 68) in which the squadron earned Top Hook honors. CAPT Overstreet also commanded Airborne Command Control and Logistics Wing from March 2016 to August 2017. CAPT Overstreet’s tours ashore include VAW-120 for duty as an Instructor Pilot, Naval War College, Joint Forces Command as the J9 Joint Experimentation Operations Office, and Battalion Officer at the United States Naval Academy. 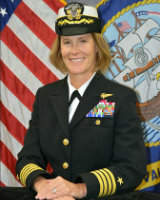 CAPT Overstreet is currently assigned as the Chief of Staff, United States Naval Academy. CAPT Overstreet's personal awards include the Legion of Merit (2), Bronze Star, Defense Meritorious Service Medal, Meritorious Service Medal, Strike/Flight Air Medal (4), Navy Commendation Medal (3), and Navy Achievement Medal (2), along with numerous campaign and unit awards. CAPT Overstreet has accumulated over 4300 flight hours, and 425 carrier arrested landings.